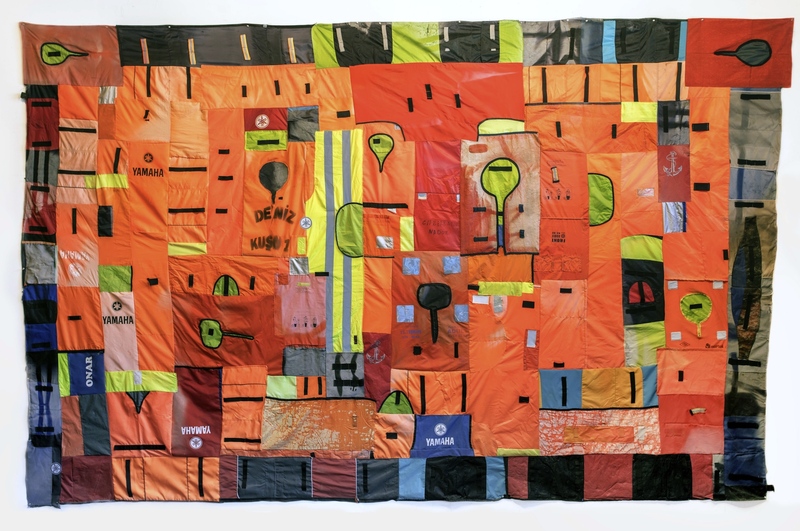 Recovered life vests from Lesvos, Greece, thread; 110″ x 175″. This flag is made from ocean plastic refugee life vests salvaged from Lesvos, Greece. Drifters Project/Lesvos Solidarity began in May 2016 with initial connection and volunteering in 3 refugee camps and furthered in Dec 2016 in the Pikpa camp, where this piece was begun. Residents of the refugee camp at Pikpa collaborated with Drifters Project in the design, and initial assembly of the Flag of Lesvos. It was completed at my studio in Atlanta, GA. It is a discrete object that functions as part of the larger collaboration of social enterprise between Drifters Project and Lesvos Solidarity, a group of citizens from Lesvos and an elastic group of refugees that create beautifully designed messenger bags and handbags (by a Lesvos designer) that we sell to provide funds to continue the workshop (100% of sale goes to Lesvos Solidarity). I have facilitated the sale of hundreds of these bags in the US through my exhibitions.